Back in 2011, 87% of the terms sales and marketing used to describe each other were negative. From experience working with all types of business, the relationship between sales and marketing has improved a good deal since then. There’s now a better understanding of how the two departments are heavily interdependent, so efforts are made to ensure they at least get on. But here’s a thing you won’t hear many marketers say out loud: marketing’s main objective should be to make life easier for the sales team. Sales is bloody tough. Marketing isn’t exactly a holiday but, typically, sales have big targets to hit and a lot more pressure than the marketing department. Marketing also don’t have to deal with the pain of putting serious time and effort into a sale, only to be ‘ghosted’ by the prospect. You’ve got to have a broad set of shoulders and thick skin to work in sales, or the stress of trying to close deals and meet month-end targets can all get a bit much. This pressure and stress can often be reflected in the turnover of a company’s sales force, which is more often than not the department that does the most hiring and firing every year. 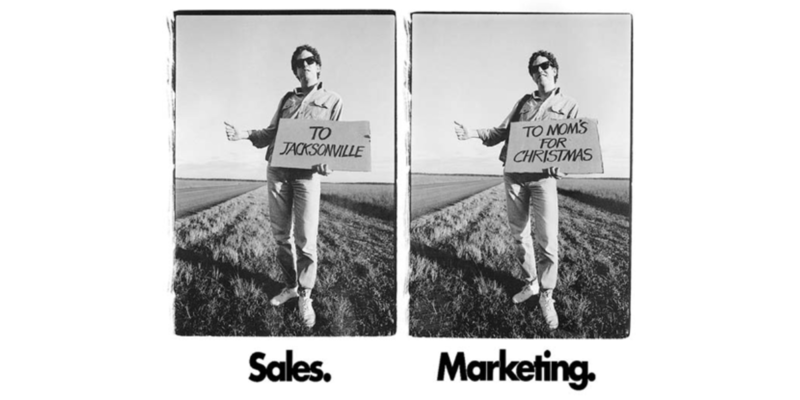 If you’re having to say goodbye to more salespeople than you’d like to each year, blame marketing. Ok, maybe that’s a little harsh, but marketing (when done right) can certainly have a huge role to play in relieving the pressure on the sales department, feeding qualified leads into your sales team's pipeline each month to relieve some of that stress. And with less stress, the huge cost of recruitment will also be significantly reduced. So what does marketing need to do, exactly? You probably know the answer already: to generate more qualified leads. But there’s a big difference between leads qualified by marketing (MQLs) and those qualified by sales (SQLs). In other words, marketing qualified leads have progressed down the sales funnel; they’ve been warmed up already by reading content on your site, opening emails and generally engaging with your company online. Getting leads to that point isn’t easy, but makes the role of the sales department much easier when done correctly. Salespeople often have to try and make contact with prospects while they’re still in the early stages of the sales pipeline, often before they even know who your company is what you do. If marketing haven't nurtured a lead to the point where they are ready for a call, this makes the salesperson’s job very hard and they revert back to the traditional cold call. How does marketing generate qualified leads? Content is key. High-quality content that helps solve the problems of your audience - e.g. tip sheets, relevant blog posts and whitepapers - is what will initially generate awareness of your brand. Then marketing can set about moving leads along the sales funnel with content that’s more personalised and specific to your product or service. Then, once these leads are passed to the sales team, they’ll be ready to talk about your solution. No awkwardness, no stress and very little education needed. But marketing can’t do it without you. Through speaking to the target market directly, hearing their pain points and brand perception first hand, sales know the target market just about as well as anyone in the organisation. However, if you aren't telling marketing about the face-to-face conversations you’re having with prospects - their objections, the things that hook prospects, the new competition a prospect talks about etc. - then what chance do marketing have of creating a strategy that’s relevant for the target market? To put it bluntly, without your input, marketing won’t have the knowledge and tools to make your working life easier and more successful. So, there’s selfish and mutual benefits to working in harmony with marketing. Any business and marketing strategy, then, needs alignment between marketing and sales. To learn about how to create an effective strategy for growth, download our free guide below. It could also be a good conversation starter for when you discuss departmental alignment with the marketing and operations heads.